ClubCoins Needed: 170 Please note that this item is not available on your device. You may add the item to your Wish list and redeem from a compatible device. Attention deficit disorder causes intense unhappiness. Men and women who truly desire a close relationship often find that their day-to-day behaviors interfere with the very intimacy they seek. Understanding ADD can provide hope. In this book Dr. Amen shares both a professional and personal knowledge of the disorder. 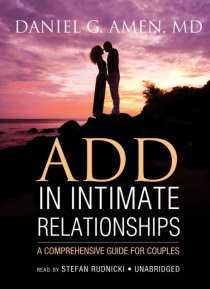 ADD in Intimate Relationships is a must-read for anyone struggling with this dise… ase.